We had a bit of a dramatic end to last week with my daughter being hospitalised. She is absolutely fine now, but it certainly threw my stats out a little as I was unable to eat for most of Friday. 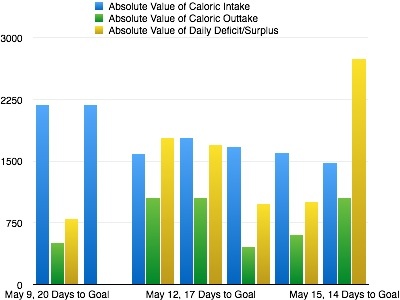 Undereating can cause overeating longer term – but I think I managed the diet side of the break in routine as well as possible. At the end of the week, I am down almost 3.5 kilograms, and I’m on track for my 5 kg goal – only just over a week to go! Two things stand out here. First, last Sunday there was no outtake and no deficit. It was Mothers Day. I did fairly well staying within my calorie limit for the day, and given this is a once in a while event I think that’s actually quite a win. I won’t have lost weight that day – but I did share a beautiful day with my children and husband and nudged just a little. 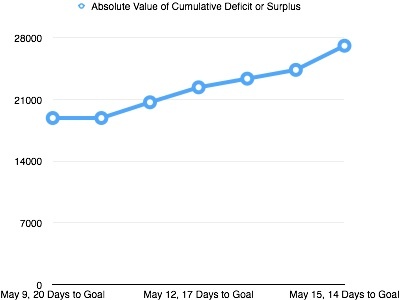 Second, on Sunday the deficit is huge. this is the day I spent in hospital and ate nothing but a ham sandwich and a small Mars Bar. Extraordinary times. 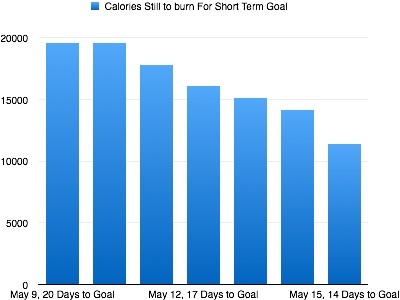 What this graph reminds me is that life is not always able to be controlled to the calorie. But then this experiment is not all about calories, its about weight loss through common sense. Common sense says enjoy a bit of fun on Mothers Day and be at your daughter’s bedside when you are sick. Other diets are generally very rigid in one way or another, and would possibly proscribe going hungry instead of eating a grainy bread sandwich with a slice of lean meat if that’s all that’s on offer or denying my kids the joy of serving me misshapen, (and somewhat cold), pancakes for breakfast in bed. Life cannot be lived this way in perpetuity, and lifestyle is about the long game, not short term wins that will reverse very quickly. I lost a very respectable nine thousand odd calories this week. In seven days full of ups and downs, this is just over a kilo. A good job. Cumulatively, I have reached the equivalent of 3.5 kilograms so far, and this week contributed just over a kilo. Onwards and upwards! Following from last week’s Non Diet Approach, I have come across a fantastic initiative by the Butterfly Foundation. The campaign, called ‘Don’t DIS My Appearance’, denounces body shaming in all its forms, and promotes a positive body-image. 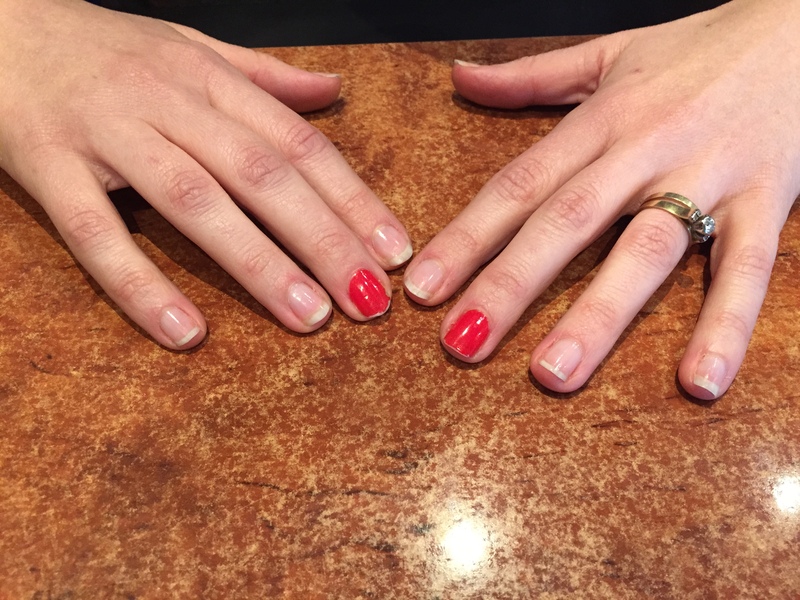 Participants paint their middle fingers on each hand every day for the month of May, and if they see anyone shaming another person for the shape of their body, they display the middle finger in a upright manner – they give the offender the bird. It is an interesting topic that behaves a little like a rather large elephant, (not that I’m shaming), in a very small poorly ventilated room – can body image have an impact on the ability to maintain a healthy weight? Can body image negatively impact weight loss potential? This link is to an excerpt from Part 3 of ‘Zen and the Art of Dieting’ in Pscychology today. I recommend reading the entire series. they are short and sweet and incredibly well referenced – plus they discuss the reasons why diets don’t work and how body shaming affects our ability to lose weight. In short, with each diet, success rates get lower and lower, which means if you have ever dieted before you have already statistically reduced your chances of losing weight. There is obviously a metabolic component to this result, but the psychology of dieting and the body shaming that is at the beginning, middle and end of every diet is clear. Dieting also increases your chances of trying another diet, and therefore of more failure. The cycle, which we all know as ‘yo-yoing’, is incredibly damaging and does not make for a happy, healthy, or even skinny, life. The Butterfly Foundation ‘Don’t DIS My Appearance’ Campaign is aimed at reducing the impact that eating disorders have on our society, but I think it can be extrapolated to the general population. The more people focus on long term health, the better their lifestyles will be.